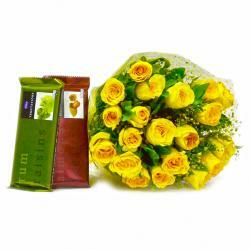 Product Consists: Bunch of 10 Yellow Roses along with 10 Assorted Cadbury Chocolate Bars (worth Rs. 10/- each) and 1/2 kg Chocolate Cake. (Note: The image displayed is indicative in nature. Actual product may vary in shape or design as per the availability). The Gift hamper of Flowers and cake its together, these stunning blooms makes a meaningful gift for friends, family members, and the one that always makes you smile. 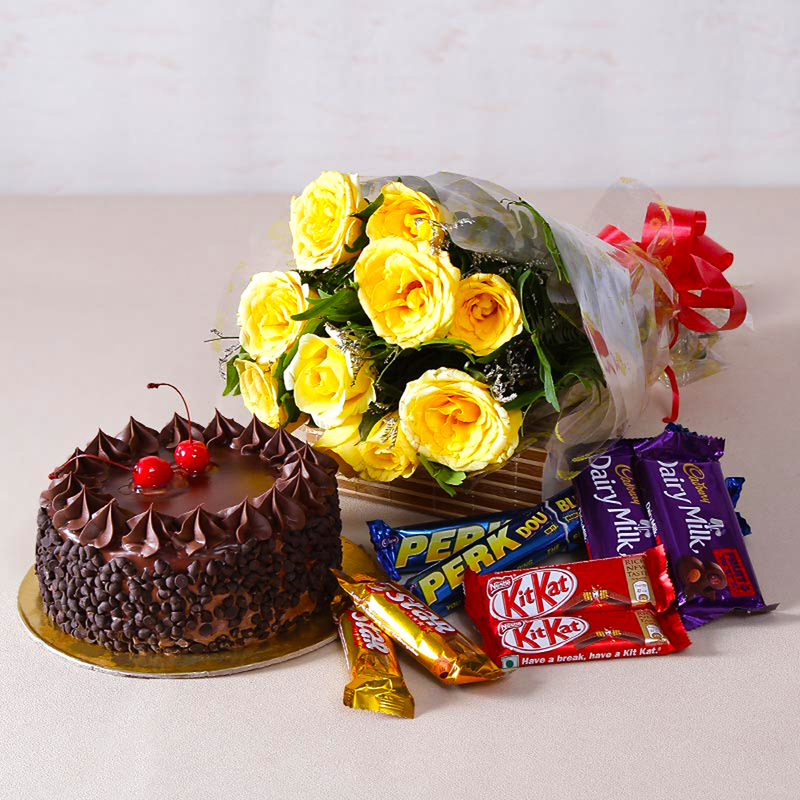 So send this beautiful flowers bouquet including ten yellow roses with green filler along with mix cadbury chocolate bars and half kg chocolate cake easy way to make them smile. A perfect gift for occasions like Birthday, Anniversary, Missing You, Ganesh Chaturthi, Boss Day, Holi or any other special occasion. Along with this, send other Gifts to India through Giftacrossindia to be delivered in a safe and speedy mode. 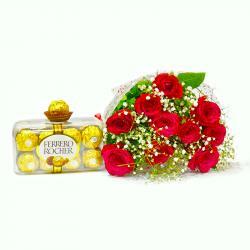 This gift hamper contains : Bouquet of 10 Yellow Roses along with 10 Assorted Cadbury Chocolate Bars (worth Rs. 10/- each) and 1/2 kg Chocolate Cake. (Note: The image displayed is indicative in nature. Actual product may vary in shape or design as per the availability).